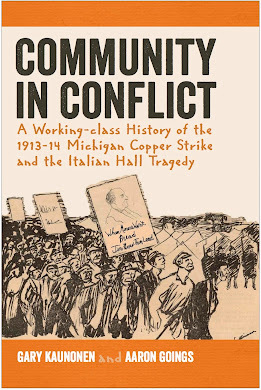 Community in Conflict was honored to be nominated for this award because the Gjerde Prize is administered by the Midwestern History Association and is awarded to the best book authored on a Midwestern history topic during a calendar year. There were some excellent books nominated in addition to Community in Conflict. These included (among others): Michael Schumacher's, November's Fury: The Deadly Great Lakes Hurricane of 1913 (University of Minnesota Press); Dean A. Strang's, Worse than the Devil: Anarchists, Clarence Darrow, and Justice in a Time of Terror (University of Wisconsin Press); Sylvia Bell White and Jody LePage's, Sister: An African American Life in Search of Justice (U. of Wisconsin); David Vaught's, The Farmer's Game: Baseball in Rural America (Johns Hopkins U. ); and Richard Drake's, The Education of an Anti-Imperialist: Robert La Follette and U.S. Expansion (U. of Wisconsin). Ultimately University of Minnesota Press author Aaron Shapiro took home the prize with his Lure of the North Woods: Cultivating Tourism in the Upper Midwest. The Gjerde Prize is named for University of California-Berkeley historian Jon Gjerde, who wrote extensively about the Midwest and its immigrant peoples. Gjerde, who was born in Waterloo, Iowa, earned his BA from the University of Northern Iowa and his Ph.D. in history from the University of Minnesota and went on to become the Alexander F. and May T. Morrison Professor of American History and American Citizenship at the University of California-Berkeley, where he also served as Dean of the Division of Social Sciences in the College of Letters and Science. Gjerde passed away suddenly in October 2008. In the fall of 2014, the MHA’s annual book award was named in his honor.